Mornin’ kids… I’m on a roll! So y’all know I like to read. A lot. And then I like to talk about what I read so other people can read it too. Today’s post is all about something I read. My good friend, Stephen Zimmer, published a collection of short horror stories last year entitled Hellscapes. (By the way, he totally doesn’t know I’m doing this, so his reaction will be big fun!) When it went on sale earlier this year, I snapped up my copy, and over the last few months I’ve been reading the stories one at a time. One at a time is good for this collection. Trust me. More than one will give you nightmares. 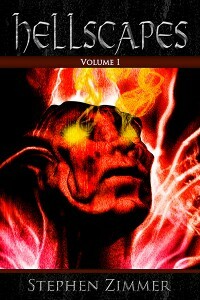 Hellscapes, Volume 1 is the first release in an exciting new themed horror collection from Stephen Zimmer. In a word: TWISTED. This book is dark, kids. It’s creepy, it’s scary, and it’s deeply poignant. Psychological and situational horror combine to bring you a brand new set of nightmares. Just as the title promises, each story is a glimpse into the personal Hell of its main character. There’s chaos and destruction, debauchery, and even a little bit of a sad love story. Human emotions are powerful things, as is evidenced in every story in this collection. If I had to pick a favorite, I think it would have to be The Grove. I knew what was happening long before the main character did, but that just made the anticipation even sweeter. A close second would have to be Drowning in Tears. It’s a horrifically beautiful display of obsession. To be honest, there isn’t a bad story in the bunch. They’re all good, all frightening, and all perfectly executed. The reason I said reading them one at a time is wise is because they truly are frightening. More than one is almost guaranteed to induce nightmares in even the strongest of minds. Overall, an excellent display of literary terror. Kickin’ it “Olde School” – New Book Review! My buddy, cohort, unofficial consort, and all around partner in crime, Selah Janel, has finally lost complete control of her book and the good people at Seventh Star Press have released it into the wild! It’s not every day I get my hands on a book that I want to shove in everyone’s hands and make them buy it, but this one I do. Everyone needs a copy of it. Everyone needs to read it. Guys, I seriously love this book. But there’s more. I’m going to give you a fun review of it as well, because I can and I want to. Keep reading, kids. It’s worth it. As a member of the “Acknowledgements” family at the beginning of this book, I had the rare luxury of reading it in all of its incarnations over the last few years. I’ve watched it grow and change from a silly idea in a hobbyist writer’s imagination to the epic folk-fantasy adventure before me as I write this. And I’m not just saying that as an insider. I stay that with all the respect and admiration that this book deserves. It’s a non-stop wild ride through classic folk and fairy tales, modernized to include every generation and genre under the sun. It’s fantastical, it’s out there, it’s knee-slapping hilarious, it’s pushing the limits and stretching the boundaries, and it’s even oddly poignant at certain moments. From my first glance into Trip-Trap’s all the way up to the very last word, I was entranced. Paddlelump is a doll, and if I were Flora, I’d have a soft spot for him too. Ippick is my new personal hero, as cranky and crotchety as he is. And then there’s Clyde, the newfound love of my life. But I won’t spoil that surprise. The characters have such great chemistry, and even poor, little Nobody and her pitiful need for acceptance. Between the witty conversation and the intricate and winding European-style fairy-tale plot lines, I couldn’t put it down. There’s so much going on in Kingdom City, and every page is a brand new adventure. Every time I pick it up and start rereading, I catch onto a subtle, new joke and I laugh a little bit harder. Would I recommend it to others? Absolutely. I whole-heartedly recommend this book to anyone that happens to see the pretty cover and stop to look. My only complaint is this: she hasn’t written the next book in the series yet, and I have to wait. I read a lot of books. Always have. That probably has something to do with why I write. But sometimes I get into a slump and the things I normally read just don’t satisfy me. When I get like that, very little does. At ConCarolinas earlier this month, I found myself on a panel with some creative voices. We were discussing the horror genre as a whole, and part of the panel topic was the “how far is too far” aspect of horror. A book was suggested – actually, I think James actually suggested that we DON’T read it, but I’m hard-headed – so I went and bought it. The beauty of owning a Nook is that I can buy stuff cheap. This one… it wasn’t really cheap as far as eBooks go. It cost me $7.99. And the horror doesn’t stop there. So what the hell is this book already??? There’s plenty of information on it if you follow that link. I’ll not spoil too much here. So I cracked open those digital pages and started reading. Alright, I thought to myself, this is going to be interesting. It can’t possibly be as bad as they said it is. Oh, boy… I was so very wrong. The story revolves around several sets of characters in varying degrees of detail. One thing is obvious, though. Ed Lee really enjoys blood and guts. It’s rare for me to find a book that makes me put it down and walk away, but more than once I had to. From brain-eating to necrophilia to forced brownplay to vomit retrieval, this book is a big, fat, shuddering EEW. Morally, socially, and psychologically offensive, there is something in this book guaranteed to upset everyone. When I have to skip passages and whole pages? Yeah…it’s bad. The characters are interesting. I spent all 227 digital pages genuinely concerned for Jerrica, Charity, Annie, and Tom. I wanted to know more about them. I wanted to know why things happened the way they did…where the dreams came from…if they were going to make it. Don’t get me wrong…it works, and it works well. The deep-rooted psychological issues of the main characters unfold like the layers of an onion, and as each gains more and more screen time, we start to realize just how screwed up these people really are. Yes, I expected the connection between The Bighead and the other characters. I even understood the problems with the Abbey. What lost me, though, was the nice, neat little package created by the one great revelation. That having been said, I love the way the book ends. I won’t say its anticlimactic because it really isn’t. It’s big. And it’s not a happy ending. So now the big question… DID YOU LIKE IT OR NOT??? Yes and no, if that makes sense. It’s a fabulous book – well written (a few grammatical borks, but I’ll point the finger at the editor for letting those slip), interesting and perfectly executed despite the contrived ending. I would recommend it in a heartbeat to any horror aficionado who thinks s/he can’t be freaked out, grossed out, or otherwise offended. But honestly, I didn’t enjoy the read as much as I would have liked to. I can get behind senseless violence and doing things for no reason other than because you can, but wow. This was a rough ride. If you’re feeling really brave, go ahead and buy the book. But take a barf bag with you. And don’t say I didn’t warn you.